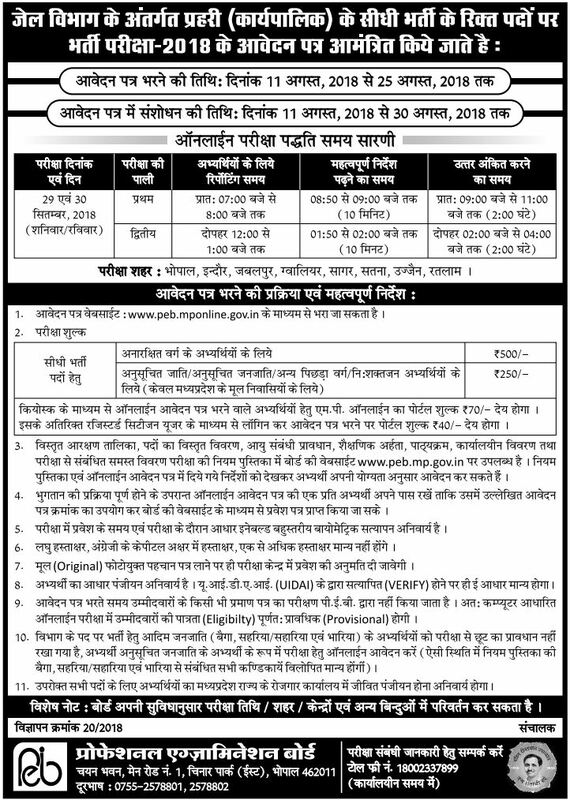 Madhya Pradesh Professional Examination Board (MPPEB) VYAPAM Has Recently Invited Online Application Form For Post Of Jail Prahari/warder Who Candidates Interested Qualify All Eligibility Criteria And Apply Online Form For Post Of MP JAIL PRAHARI. Before You Apply Online Application Form Please Read Full Notification. Payment Mode-Submit fees through Online Debit Card, Credit Card, Net Banking OR Pay through MP KIOSK. Candidates Must Have Passed10+2 (Intermediate) in Any Recognized Any Board Indian States. How to Apply for MPPEB Jail Prahari Recruitment-2018 – MP VYAPAM Interested Candidates Can Submit Their Online Application For The Prescribed Posts Through The Direct “Apply Online” Link Given Below Or They Can Also Apply From The Official Website Of MP Online.